Hollis Johnson/Business InsiderLast week, Tesla started allowing all customers to configure and order the Model 3. Tesla‘s US website is allowing customers to order the Model 3 again. For a brief period Monday morning, the website was not allowing Model 3 orders. Last week, Tesla started allowing all customers to configure and order the Model 3, though the $US35,000 base model is not yet available. Tesla‘s US website is allowing customers to order the Model 3 again. For a brief period Monday morning, the website was not allowing Model 3 orders. Next to the message was an image of a blue Model 3. At the time, the page contained no other information about the vehicle or any prompts that lead to other pages. 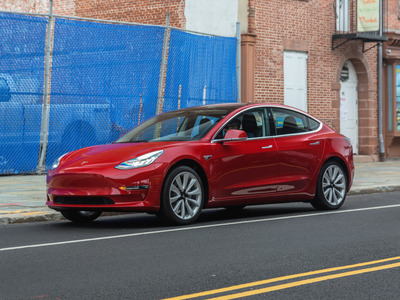 The Model 3 is Tesla’s first mass-market vehicle, designed to broaden the company’s customer base beyond the luxury segment and increase the rate of electric vehicle adoption. But Tesla struggled to ramp up production after it was launched in July 2017 due to excessive automation at its factories. 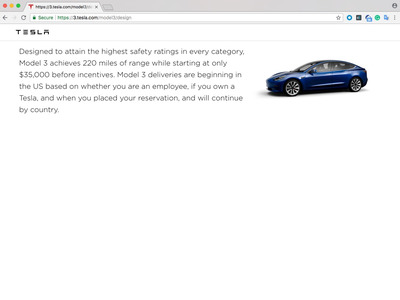 TeslaThe Model 3 order page on Tesla’s US website, before the website began allowing orders again. Last week, Tesla started allowing all customers to configure and order the Model 3, though the $US35,000 base model is not yet available. In late June, a Tesla representative told Business Insider it would be available in six to nine months for those who had already made reservations. That’s longer than a timeline given by CEO Elon Musk in May, when he said the $US35,000 option could become available between September and December.